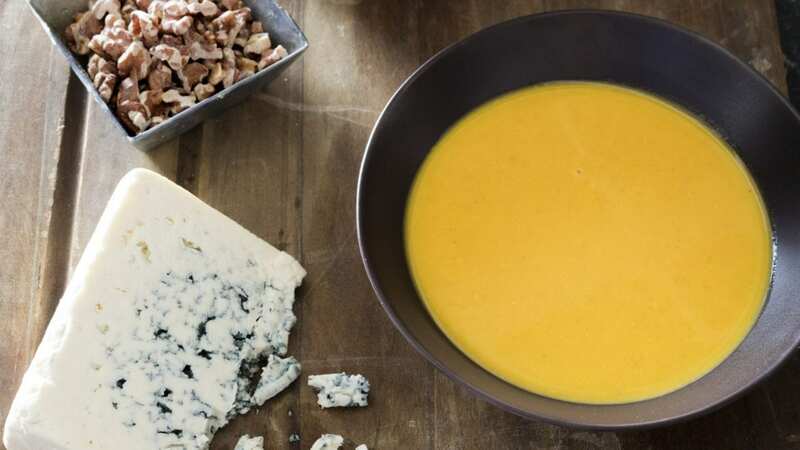 This velvety pumpkin soup is surprisingly easy and fast thanks to canned pumpkin. The trick is getting rich, balanced pumpkin flavor out of a can. We started by creating a deeply flavorful base for our soup by softening onion and then adding cumin, coriander, and nutmeg, which gave us a warm-spiced flavor that paired well with pumpkin. Maple syrup was the ideal sweetener, adding depth and enhancing the nuttiness of the soup without overwhelming it with sweetness. Love to cook at home? Want to learn some new skills in the kitchen? Find “America’s Test Kitchen” on Kansas City PBS in our schedule and watch at 11 a.m. on Saturdays. A combination of vegetable broth and water gave the soup a subtle savory backbone, and just a half cup of half-and-half gave us an ideal creamy texture. Briefly simmering the pumpkin in the flavorful liquid allowed the flavors to meld and cooked off the tinny flavor of the canned pumpkin; we then pureed the soup to a silky consistency.Be sure to buy pure canned pumpkin, not pumpkin pie filling, which has sugar and spices added. Crumbled blue cheese and toasted, chopped walnuts make nice garnishes to this soup. Melt butter in Dutch oven over medium heat. Add onion and cook until softened, about 5 minutes. Stir in garlic, cumin, coriander, and nutmeg and cook until fragrant, about 30 seconds. Stir in broth, water, pumpkin, and maple syrup, scraping up any browned bits, and bring to boil. Reduce to simmer and cook until flavors have melded, about 15 minutes. Working in batches, process soup in blender until smooth, 1 to 2 minutes. Return pureed soup to clean pot and stir in half-and-half; adjust consistency with additional broth as needed. Heat soup gently over low heat until hot (do not boil). Season with salt and pepper to taste, and serve. Nutrition information per serving: 198 calories; 86 calories from fat; 10 g fat (6 g saturated; 0 g trans fats); 26 mg cholesterol; 417 mg sodium; 27 g carbohydrate; 4 g fiber; 18 g sugar; 3 g protein.